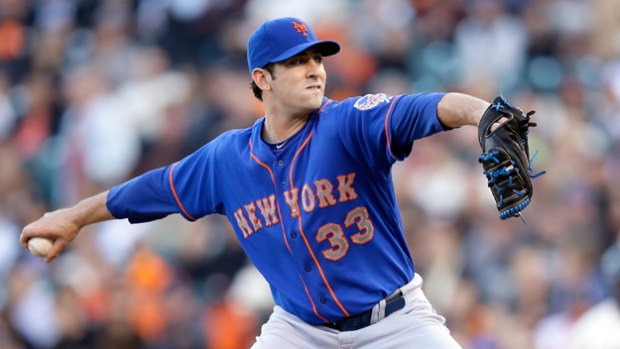 Can Matt Harvey pitch the ahead-of-schedule Mets into the World Series? On this one-year anniversary of “The Giants Win the Pennant!” 2.0 — okay, not really, but it was a day that neither Michael Morse nor Travis Ishikawa will ever forget — it’s time to reflect on the Division Series that were and the Championship Series that will be. Some thoughts now as well as predictions for the upcoming series. Houston was oh-so-close to advancing, but there is absolutely no excuse for blowing a four-run lead in the eighth inning of a potential clincher. At home, no less. Once the Astros choked Game 4 away, there was simply no way they were going to muster back up enough energy against a Kansas City team that has some October magic going for it the last two years, not to mention how overdue Johnny Cueto was for a lockdown start. Ultimately, the Royals are the better team, and Blue Jays-Royals is a much more intriguing series than Blue Jays-Astros would have been. Astros-Rangers seemed like a logical possibility, an all-Texas ALCS, but instead we get the two top seeds in the AL, because the Blue Jays found their offense just in time. They also are only the third team ever to go down 0-2 at home in a Division Series and rally to win, and the previous two made the World Series, with one winning it. A wild seventh inning in Game 5 should propel what was a somewhat-listless Jays team prior to that outburst. Good riddance to the $300 million paper champion Dodgers. I felt all along this team was a fraud and not designed to make any noise in the playoffs, and Game 5 absolutely epitomized that. The Mets did all the little things right and the Dodgers did them all wrong. LA was a two-trick pony all year (with a great closer, I will admit), but that doesn’t win you playoff series. Instead, you lose them by going 2-for-13 with runners in scoring position; by catching a fly ball that could have dropped foul instead of being a game-tying sacrifice fly; by not moving runners over or getting them in; by falling asleep at the wheel and letting a runner steal third base… on a walk. The Dodgers’ front office seems to be sending a message that by spending this much, it expects to win on sheer talent. The players seem to echo that sentiment with poor, unprofessional at-bats in the game’s most critical moments, not to mention continued schisms between the players and manager Don Mattingly. Expect Mattingly to get the axe. Meanwhile, Terry Collins is an old-school manager who instills hard work and fundamentals into his players, and that mental toughness ultimately prevailed against a team that appears much stronger… on paper, that is. What a power display by the Cubs against the seemingly-impenetrable Cardinals pitching staff. St. Louis became the first team in four years to win 100 games, but like the previous team that did it, the Redbirds didn’t make it out of the first round. Perhaps it was a culmination of injuries and overachieving finally catching up to them, or perhaps the Cubs simply weren’t intimidated by the Cardinal Way mystique that seems to have been building. Chicago didn’t exactly shut down the Cardinals offense, but it didn’t have to. Watching these powerful rookies was quite a display, and ultimately the nation is spared from more Cardinal magic. Once the Cubs won Game 3 despite a rocky start from Jake Arrieta, you had to figure things were going their way. The Carlos Martinez injury also proved to be a big one for the Cardinals, who had to turn to John Lackey on short rest, and Lackey was very ineffective in three short innings. Ultimately, this is the best matchup of the four we could have gotten, primarily because of the bad blood that has been boiling since the teams’ last meeting in August. Toronto almost closed a 12-game gap in the standings to nab home field from KC, but the way things are going in terms of momentum for Toronto, and how the Royals narrowly escaped disaster against the upstart Astros, things should favor the Blue Jays here. Their lineup is much better than the Royals’ and their starting pitching is marginally better, even if the Royals have an edge in the bullpen. Prediction: Blue Jays in 5. Instead of predictable, stale Cardinals-Dodgers, the world is treated to two upstarts in big markets in the Cubs and Mets. Better yet, we may get to see more of the incredible power display from the Cubs… or do we get to see more dominance from the Mets’ young power-arm-stocked rotation? The Cubs went 7-0 against the Mets this year, including a three-game series at Citi Field in which New York scored one measly run over three contests. But all of that was before the trade deadline when both teams, but especially the Mets, underwent roster makeovers. Home field is big for the Mets too, as they were 49-32 this season, but the equalizer might be the Cubs’ 48-33 road mark. Still, can Arrieta keep this up? Can Jon Lester look like the Jon Lester of old? This has the feel of a too-good-to-be-true story for the Cubs. Both teams are “ahead of schedule,” so to speak, but the rotation depth of the Mets and large quantity of strikeouts Cubs hitters accumulate could be the difference-maker. Prediction: Mets in 6. Be the first to comment on "A look back at the Division Series, ahead at the LCS"